WASHINGTON, D.C. -- As President Barack Obama works to make environmental protection a key issue in the final two years of his administration, about half of Americans (52%) say he is doing a "good job" of protecting the environment. They are less likely to say he is doing a good job of improving the nation's energy policies (39%), a difference seen throughout his administration. These data, collected March 5-8 as part of Gallup's annual Environment poll, come as Obama places greater focus on environmental issues -- from his plan to sign an executive order that all federal agencies cut back their greenhouse gas emissions to a larger effort to reduce such emissions globally. Shortly after Obama took office in 2009, about four in five Americans said he was doing a good job on the environment (79%), but this figure fell by 2010, consistent with the drop in his overall approval rating. 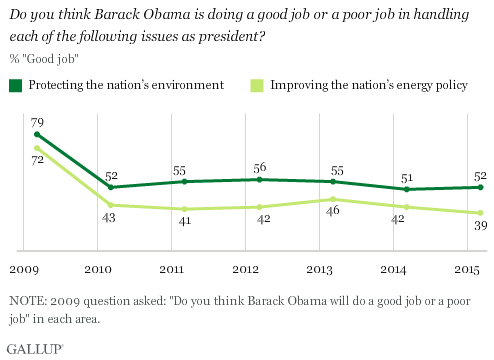 Since 2010, between 51% and 56% have given Obama a positive rating on the environment. On national energy issues, too, the percentage of Americans who feel Obama is doing a good job has been stagnant in recent years. After a high of 72% in Obama's honeymoon period shortly after taking office, this figure dropped to 43% by 2010 and has remained at about that level in subsequent years, with his current 39% the lowest by two percentage points. Obama has recently pushed for an expansion of renewable energy such as solar and wind projects. His administration also seeks tougher standards on oil and coal companies that extract resources from federal lands. Such policies would place restrictions on pollution while creating incentives for investing in renewable energy, which is expected to have some pushback from the GOP-controlled Congress -- many of whom argue the incentives favor some businesses over others and misuse taxpayer dollars. Obama's positioning on the relationship of energy policy to environmental protection was exemplified by his veto of congressional legislation that would have authorized the building of the Keystone XL pipeline from Canada through the middle part of the country. His veto was based in large part on safety and environmental considerations, even as pipeline advocates argued that the pipeline would create tens of thousands of construction jobs and decrease U.S. dependence on Middle Eastern oil. Americans have consistently held Obama in greater esteem on the environment than they did his predecessor, George W. Bush, whose ratings on environmental protection sank further each year into his administration. Bush received a high "good job" rating of 51% just after he took office in 2001, and this fell to a low of 30% in 2007. His ratings on the environment leveled off in his final year in office, when 31% said he was doing a good job. 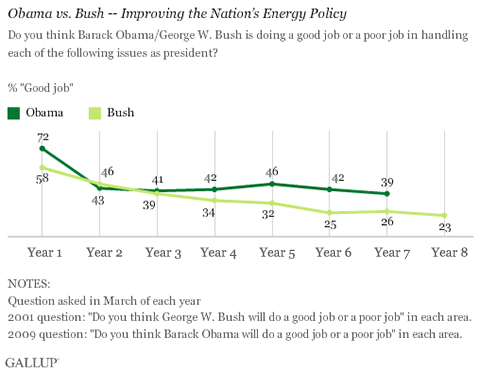 For the most part, Obama's ratings on energy policy have also exceeded Bush's ratings by year in office. 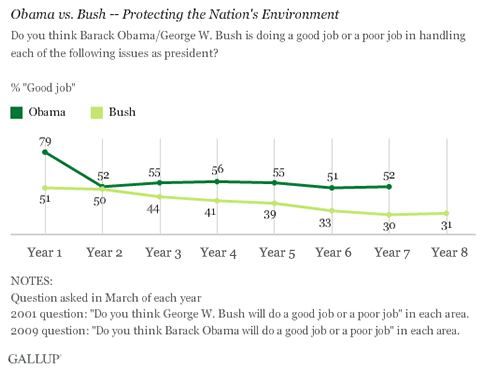 Except for his first year, Bush consistently had higher ratings on the environment than on energy, even though both ratings fell during his administration. Democrats continue to view Obama's performance on protecting the environment most favorably (75%) compared with independents (52%) and Republicans (29%). All party groups give Obama lower scores for handling energy than for handling the environment. Sixty-eight percent of Democrats, 36% of independents and 13% of Republicans say Obama is doing a good job of improving the nation's energy policy. The gap in environment vs. energy ratings is greater for Republicans and independents (16 percentage points each) than for Democrats (seven points). Although Obama has just two years left in office, his efforts to make a difference on energy and environmental issues may leave a legacy for his administration. But in the meantime, his domestic and international initiatives over the last five years of his presidency have not made much of a difference in how Americans view his performance on these issues. Obama consistently gets higher ratings for his work on the environment than for his work on energy, something that is also generally true of Bush, his predecessor. Obama's recent decision to veto the Keystone XL pipeline project, citing environmental concerns, most likely highlighted his priorities on these two issues. Gallup has found that the environment and energy are among the issues Americans worry about least, so while Obama's work in this area may garner attention from politicians, energy companies and environmental groups, these efforts might not mean as much for the nation at large. Still, Americans continue to favor Obama's performance on environmental and energy policies more than they favored that of the previous president. And when it comes to protecting the environment in particular, Obama has maintained a consistent majority of those who feel he is doing a good job. Out of 15 issues, Americans' worries about the possibility of a terrorist attack and race relations increased most sharply from 2014 to 2015. Meanwhile, concerns about unemployment and the economy declined over the past year. Half of Americans say they have had a colder-than-usual winter, while 18% say it has been warmer than usual. Those experiencing a colder winter attribute it more to normal temperature variations than to climate change. The Gallup Poll Social Series (GPSS) is the primary method Gallup uses to update several hundred long-term Gallup trend questions, some dating back to the 1930s. The GPSS is designed to monitor U.S. adults' views on numerous social, economic, and political topics.